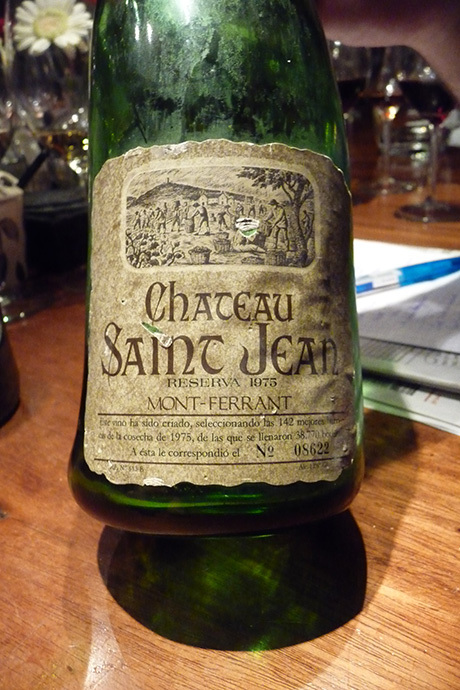 Recently a friend of us moved to Thailand and gave me this bottle of 1975 Chateau Saint Jean Reserva Mont-Ferrant wine saying “Maybe this is something for you as a wine lover”. The bottle itself is a bit crooked and its form is “patented”. I decided to taste it with my little “Taste the Globe” club of wine lovers and wine experts to be. After decanting, it appeared to be drinkable. I have to dig up my tasting notes yet. But in the meantime I would like to have some clues as to from where this wine originates. Anybody? The bottle you received from your friend was not from our winery located in Kenwood, Sonoma County, CA. Although, we were founded in 1973 and released our first wines the following year we never produced a “Mont-Ferrant” Reserva at the winery. The “Mont-Ferrant” wines I used to be familiar with were from a “cava” in Spain, not far from Barcelona. I suggest you check with them to see if this wasn’t their wine. I really appreciate you coming by and pointing me in a direction. Maybe the winery has closed. Actually I forgot to ask my friend how he got it. I’ll shoot him an e-mail. Thanks again and good luck with St Jean! tengo una botella de vino como esta, reserva 1975, me gustaria saber la cata. It is a good wine with a classic wine taste. Previous Previous post: Quote of the Day (5): More Attention Please! Next Next post: Why Blog? We don’t Care about your Blog!